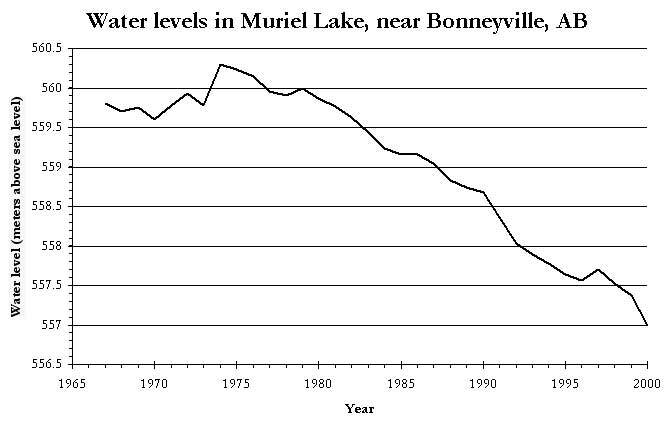 The water level in Muriel lake, located just south of Bonnyville, Alberta, has fallen more than 3 metres since the 1970s. This amounts to perhaps a 50 to 60% loss in the volume of water. The Muriel Lake Basin Management Society was formed in 1999 in response to these severe losses of water. In 2002, Dr. Bill Donahue, with the support of Dr. Dave Schindler, the Gordon Foundation, the Natural Sciences and Engineering Council of Canada, and ERSC, began a study to determine the local and regional water budgets. Drs. Bill Donahue and Alex Wolfe also began a study of the history of water quality, biology, and climate change in Muriel Lake. Muriel Lake is located 13 km south of Bonnyville, about 225 km northeast of Edmonton. The lake had an origial area of 63 square kilometres and a mean depth of 5.1 metres. The catchment area is 369 square kilometres, and there is currently no out-flow from the lake.